Secretary of State Mike Pompeo testifies before the Senate Foreign Relations Committee on Capitol Hill in Washington, April 10, 2019, during a hearing to review the FY 2020 State Department budget request. U.S. Secretary of State Mike Pompeo defended President Donald Trump's move to halt American aid to three Central American nations from which record numbers of migrants have fled to the U.S.-Mexico border, responding to sharp criticism from Democrats at an often-testy Senate hearing on Wednesday. "There's an enormous crisis at our southern border," Pompeo told the Foreign Relations Committee. "The United States has spent hundreds of millions of foreign assistance dollars to try and build out solutions in these three countries — El Salvador, Guatemala and Honduras. You can see it has not been effective. We are endeavoring to change that." Pompeo spoke two weeks after Trump announced he would cut aid Congress had approved to fight hunger, violence and drug trafficking in the poverty-stricken nations to chastise them for failing to stem a massive surge of migrants crossing through Mexico en route to the U.S. border. Democrats on the panel said the White House's move defied logic. "All this will do is create greater instability in the region," Sen. Bob Menendez of New Jersey said. "It will drive more people in fear and hopelessness to the border." Menendez added, "Why are people fleeing? They are fleeing because of violent crime. Their choice is stay and die or flee and have a chance of living. We need to fight at the very essence of that, and the very essence of that is not at the border. It's in Central America." Similar arguments were made by lawmakers of both parties a day earlier, when Pompeo appeared before the House Foreign Affairs Committee. The panel's top Republican, Texas Congressman Michael McCaul, said cutting aid to Central America "could make the situation worse, not better." Pompeo insisted a new approach is needed. "We deal in reality. It's not enough to take taxpayer money and spend it there. You need to get something for that, and that's what we are engaged in now," he said. "We want to be sure that every tax dollar we spend in the Northern Triangle [Central American region] is effectively used." One Republican concurred that the status quo is unacceptable and bold action is required. 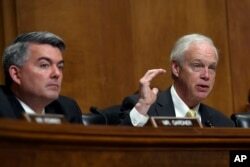 Sen. Ron Johnson, R-Wis. (R), sitting next to Sen. Cory Gardner, R-Colo., asks question of Secretary of State Mike Pompeo as he testifies before the Senate Foreign Relations Committee on Capitol Hill in Washington, April 10, 2019. "The first six months of this [fiscal] year, we're already over 240,000 [migrant arrivals], primarily people coming in as family units," Wisconsin Sen. Ron Johnson said. He added that long-term developmental assistance for Central America won't solve the immediate crisis. Administration officials have said they stopped allocating new funds to aid programs for El Salvador, Guatemala and Honduras and are looking to "reprogram" unspent funds, a move Congress could block. Appearing before a House panel to discuss foreign aid, former U.S. ambassador to the Organization of American States Roger Noriega on Wednesday noted that America helped create the migrant crisis through its appetite for illegal narcotics, which fuels the drug cartels responsible for much of the violence in Central America. "The demand for illegal drugs from this country has destroyed those [Central American] countries, and we have a moral responsibility, I believe, to help them pull out of it," Noriega said. "The announcement that we were summarily and arbitrarily cutting off aid does not help any of these [Central American] leaders be a friend of the United States. It embarrasses them before their own people. It undermines the confidence that we need to have as partners."